Valentine's Day is right around the corner and I wanted to share some V-day accessories with you guys. 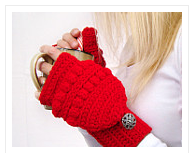 Can I just talk about these adorable fingerless mittens!? They are from and Etsy shop called Creative Endeavors KS by Kristina. I love the bright bold cherry red color, it stands out and the adorable decorative button gives it a nice touch of chic. Definitely check out more of her handmade items in her Etsy shop and tell her that I sent ya! Other accessories like makeup, perfume and statement necklaces is a must for me. I recently got the NAKED 3 palette and I love the romantic colors in this palette. It's slowly becoming my go to palette. Another favorite is "Flash" by Jimmy Choo. I love to wear this perfume on special occasions or when I'm dressed up fancy. If dinner plans are in the forecast for me and my husband this weekend then I'm going to bring out some of these Valentine's Day accessories. I've linked everything for you guys below! What are some of your V-day favorite accessories?